Our research focuses on plant nutrients essential for human health. In particular, we are interested in further the understanding of thiamin and folate metabolism in plants. Thiamin pyrophosphate (or vitamin B1) is an essential enzyme cofactor in all organisms. Thiamin-dependent enzymes (e.g. puruvate dehydrogenase, transketolase, α-ketoacid decarboxylase) play a particularly important role in carbohydrate metabolism. Thiamin pyrophosphate is an essential component of the human diet since, unlike microorganisms and plants, humans cannot synthesize this vitamin. Thiamin deficiency causes Beriberi, which disturbs the central nervous and circulatory systems. Thiamin deficiency is common in developing countries where the main food source is low in thiamin (e.g. polished rice). Current knowledge of thiamin metabolism in plants is limited. By combining molecular biology, biochemistry, and genetics approaches, our aim is to further the understanding of thiamin metabolism and subsequently engineering its pathway in staple food crops that are commonly consumed by low-income populations. In addition, thiamin has been implicated as an activator of disease resistance in plants. We are investigating thiamin as an alternative strategy for disease control in potato. Tetrahydrofolate and its one carbon unit derivatives commonly named folates (vitamin B9), are essential micronutrients in the human diet. Indeed, while plants and microorganisms can synthesize folates, humans lack this ability and require a dietary supply. A deficiency of folates in the diet is associated with the increased risk of neural tube defects, cardiovascular diseases, anemia, and some cancers. Unfortunately, current folate intake is suboptimal in most of the world’s populations, even in developed countries. We are using both metabolic engineering and traditional breeding methods to increase folate content in potato tubers. Potato Virus Y (PVY) is an important pathogen of potato. Yield losses associated with PVY can be as high as 80%. 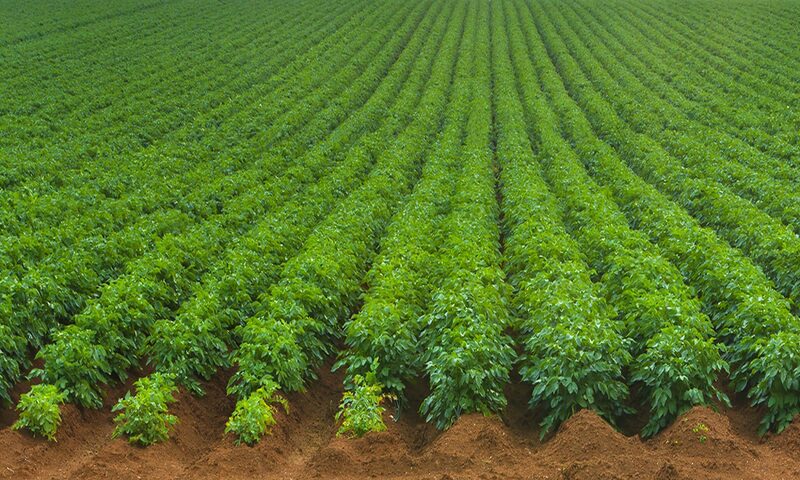 Resistant potato cultivars is the most efficient and cost-effective way to control PVY. Genes which confer extreme resistance to PVY (called R-genes) have been identified in primitive cultivated potato species, and potato breeders have developed molecular markers to assist in introducing these genes into modern varieties. Despite promises of these R-genes, potato breeders are constantly looking for new sources of resistance to overcome the adaptation of pathogens to a specific resistance gene. Therefore, our project aims to identify new sources of resistance to PVY that will be used by potato breeders to develop new varieties with more robust resistance to PVY. We are using a combination of next generation sequencing technology (RNA-Seq) and genetics to achieve this goal.